When businesses try to use several financial tools to satisfy client needs… motivating calculators in one application, needs analysis in another, and client education and presentation materials in another... it creates confusion, frustration, and low adoption in the field. In addition, financial representatives in the field are looking to integrate the sales process with existing applications to create a straight-through solution. It is the process that drives the solution, not the tools. 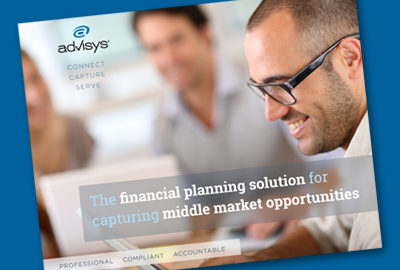 Advisys uses a powerful “Do-It-Your Way” approach to enterprise solutions, combining the most powerful financial planning and insurance sales tools and customizing them to follow your sales process and integrate with your existing applications. Now, without jumping from one tool to the next to the next, your team in the field can instantly access an all-in-one solution designed to fit the way you do business and tailor-made for their success. This unique All-In-One approach provides support throughout each stage of the sales process. It reduces frustration and increases productivity in the field while reducing expense and increasing ROI for the home office. Focus on your products and solutions. Add any or all of the 11 single-needs modules to your custom solution. They cover the range of interests by mass affluent clients from retirement, survivor needs, and Long-Term Care (LTC), to business continuation, asset allocation, and other subjects. Integrate your custom solution with your existing CRM, data aggregation platforms, lead generation tools and any web services applications to streamline workflow, improve productivity and create straight-through processing. Include any of more than 50 calculators designed to provide simple, instant answers to the most common questions your field will face: How much life insurance do I need? How long will my nest egg last? When is the best time to take Social Security? To improve usage and adoption, Advisys makes it easy to add your own proprietary content and intellectual property, including fact finder, risk tolerance questionnaire, asset allocation models, calculators, training videos, PDFs, and PowerPoints. Choose from an incredible breadth of content, presentations, and templates covering contemporary financial planning topics written in everyday language clients find easy to understand. There are over 600 reports, charts and graphs from which to choose. Your custom application benefits from extensive usage tracking and reporting already available with the Advisys platform. Reporting tracks the frequency with which users are accessing Advisys and the content and features they’re using the most. Special solutions for business and enterprise managers. Our patented compliance process automates reviews and gives you complete control over our applications and the content and features available to your users. From traditional enterprise licensing to multi-user licensing and affinity marketing discounts, there’s a cost-effective approach that’s right for you and your needs. Advisys cloud-based applications are available 24/7 wherever users have Internet access and adhere to strict standards of security for data transportation and storage. Advisys takes a disciplined approach to the customization process, meaning we can quickly produce results, typically in weeks versus months or longer. We take the time for in-depth conversations with your business experts to thoroughly understand your approach to the market and your sales process. We thoroughly document our understanding of business requirements in a statement of work, including acceptance criteria and a completion date. Due to the powerful and highly flexible nature of the Advisys platform, custom solutions generally take just weeks to produce. Our work doesn’t stop when customization is complete. We work with you to produce the training and support to assure your release is a success. This unique “Do-It-Your Way” approach starts with understanding the needs and requirements of the sales force. Let us help you build the business case for improving usage, adoption and generating more sales.